Working from home can be a dream come true. You can set your own schedule, be at home for your children, and even homeschool, if you so choose. However, many people don’t trust that there are legitimate work from home jobs available. If you’re good at something, consider coaching others so they can learn to do the same thing successfully. You could coach people how to sell online at places like Etsy and eBay, or you could coach people to be successful in their businesses, whether that business is online or not. Review Blogger—You get products for free in exchange for reviewing and sometimes giving them away on your blog. Deal Blogger—You find the greatest deals and share them with your readers. To succeed in this field, you’ll want to find a specific niche of deal blogging like Mara who blogs about the latest deals for kosher folks on her blog, Kosher on a Budget. Brand Ambassador—As a brand ambassador, you’ll promote a specific brand’s product, write posts about them, and promote the company as detailed in your contract. Some bloggers are brand ambassadors for multiple companies. Online Community Manager—In this position, you’ll act as a go between for the blog or company and the readers. You may also become known as the “face” of the brand. Freelance Writer - This is a general term for writing for any business or entity as an independent consultant (not an employee). You could write using your own name, or you may provide your content to the client for them to use their own name on -- also known as "ghostwriting." Freelance writing jobs for beginners can be harder to come by, but they are out there! Freelance Writer for Parenting Magazines—The real money here is in retaining the rights to your work so that you can resell it to secondary markets. Columnist - Online and print publications need short article writers to come up with content monthly, weekly, or even daily! Your articles usually follow a theme based on your experience or writing style. Religious Historical Writer—As a religious historical writer, you’ll create religious documents for young children. The key is to find a need for a specific type of material and fill it. Soap Maker - Give customers a truly unique experience with your own scents, designs, and recipes. This is a very artistic business! Goat Milk Soap Maker - Take the beauty of farming and soapmaking to another level; combine the richness of goat's milk with the artistry of soap. Being a virtual assistant is not a one-size fits all job. With this job, you’re daily tasks will be very different depending on what you do for each client. You may edit and schedule posts for a blogging client, tackle Facebook for a real estate client, and do business research for another, all in the same day. This field is exploding, so now is a good time to start. Education Printables Creator—From your blog, share educational resources and charge a small fee. As your blog grows, so will interest in your products. eBook and Curricula Creator--Create curricula and sell it on sites like Teachers Pay Teachers. Homeschool Evaluator—Some states like Pennsylvania require that homeschool families create portfolios and have them reviewed by experts. Depending on your experience, you could be that expert. Piano Teacher—If you are gifted with voice or instruments, you could offer lessons right out of your home. Some jobs you may do from home aren’t that much different from jobs you would perform in the office setting. Bookkeeper - Everyone pays bills and files taxes. Keep your clients organized and on the right side of their finances with these services. Public Relations—As a public relations specialist, your jobs may include writing press releases, marketing, creating newsletters, and developing and implementing a public relations plan. Courthouse Researcher—Some companies hire independent contractors to do courthouse research for them. Don’t forget, you can also create your own job. Whether you make a craft and sell it on Etsy or you find a need in the market and create a product to fill it, the opportunities are endless. Etsy Store Owner—This field is exploding, which makes it very competitive. To succeed, you need to sell something unique and do your research about how to best promote your business. Lunch Box Entrepreneur - You'll have to read about this innovative business to believe it! Custom Robe Entrepreneur - Cuddly robes for everyone. Franchise Owner—If you want to operate your own business, a franchise may be the way to go because the company has already done most of the behind-the-scenes work for you including researching what works and what doesn’t. In addition, you’ll have the company to rely on for support. Online Linen Store Owner—An online store can be great for a work at home parent, especially if you’re naturally introverted. Steve and his wife opened an online linen store, and they’ve been so successful, they also coach others on how to open their own stores! Home Day Care Provider—Keep in mind as a home daycare provider, you may need to get licensed by the state you live in. 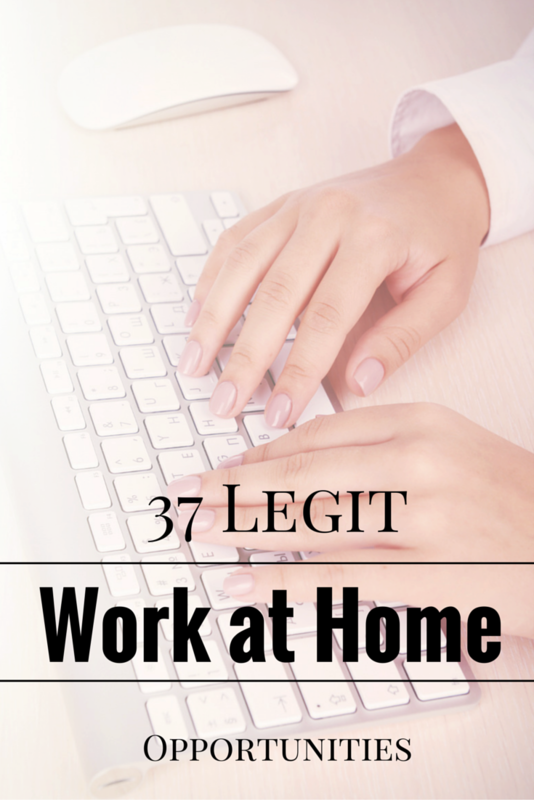 If you want to work from home but worry that there are no legitimate opportunities, this list should show you that there are plenty of legitimate work from home jobs, many of which you can create yourself. Do you work from home? If so, what is your job? Yes I work from home!! When I realized I had no time to spend with my children and someone else was raising them I decided to find something better. For the past two years I have work as a Juice Plus+ representative changing how people view food & nutrition. And I have loved every minute of it! Thanks for your comment! I think most of us that work from home are so appreciative of the time we get to spend with our families. I am an Independent Educational Consultant with Usborne Books & More. I love what I do for so many reasons. I love my company because it's been in the US for over 25 years, it's debt free and books/education are always needed for families and schools and libraries and preschools and... There are still less than 10k consultants in the entire USA so the field is still wide open, too.